This beautiful 132 guest room brand new motel was built in 2007 and is ideally situated only minutes from the Horseshoe Falls and the surrounding attractions. All rooms at this Niagara Falls Motel offer the best amenities that help make your next stay more enjoyable with affordable rates. Guests of the motel can enjoy wonderful amenities such as free parking, free stay for children, free morning coffee. This 3 star, new Niagara Falls Motel is located in the heart of Niagara Falls and only minutes from the main attractions such as Casino Niagara, Fallsview Waterpark and Clifton Hill. 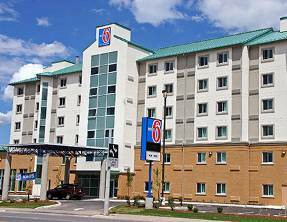 The prefect accommodation in Niagara Falls for the business and family travelers alike, Motel 6 Niagara Falls provides guests with the necessary free amenities such as parking and local phone calls. The Motel 6 Niagara Falls offers a free stay for children under the age of 17 and pets are allowed in the motel as well. Mini fridge in each room, 26″ Flat Panel Cable Television, & Wi-Fi Internet Access top off the wonederful amenities avaible at this motel.